Welcome to my FJ Cruiser Pages. 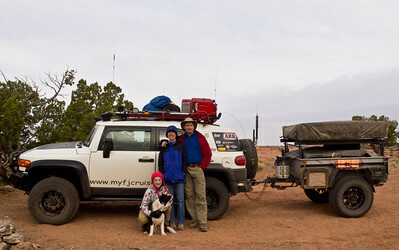 Our Toyota FJ Cruiser, The White Knight, has been built for expedition adventure trips. This is our second Toyota FJ Cruiser, our first, the Blue Burro was totaled in a roll over. Since we purchased our first FJ we have covered the South West United States, from California to Texas and all states in between. On this site I share information on our adventures and the equipment we use. Information about where we have been includes little gems along the way. We spend lots of time in the Toyota FJ Cruiser and using the modifications we have made so I am a pretty good judge of what works and what does not. The FJ is just the latest chapter in my adventures, I started experiencing the outdoors as a child in Aspen CO in the 1960 and I have been venturing outside in some way ever since. We hope you will follow along on our 40 to 50 days worth of trips a year. I just picked up my first FJ, a 2012 with the offroad package. Just wanted to say that your website provided a lot of inspiration and helped with the choice of vehicles. Glad that our information helped you decide on the FJ. We met at Natural Grocers. I am inspired by your FJ and web page. We will be adding some of your mods on our military green ‘baby’ FJ. Great looking FJ! Saw you guys on the road the other day and then at a resort parking lot so I had to check out your page. Talk about FJ envy! Thanks, hope you had a great day at Keystone. Hi Tomas, would you mind sending me some pictures of your trailer. Currently designing one and I quite like your layout. Also, does the tent plateform raise up via the large struts you have fitted. I like the idea of being able to raise the tent so you can walk under it. Also, great info on your rig and products on offer. Just spotted your expedition setup at Cottonwood Hot Springs. Serious setup for clearly serious trips. Rock on!